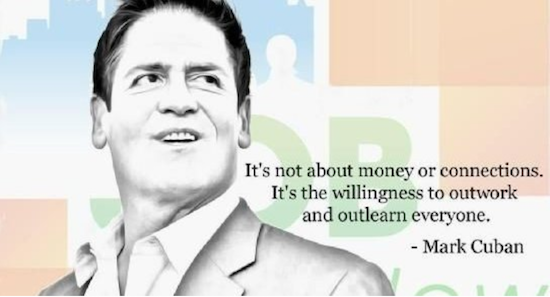 Mark Cuban's quote is my life's mantra. To outlearn everyone, I read a business, technology, or science book a week (current read: The Rise of the Robots by Martin Ford). I was stunned years ago when I read that the average American college graduate reads only one book a year. That number spells opportunity to me, and I am not alone. Warren Buffet speaks about proactively building an "information advantage" with his aggressive learning habits and routines. Mark Cuban is no slouch, either. Only good things can happen when you invest in your knowledge. To be valued, be valuable. I realized that while I was reading voraciously, it wasn't as effective as it could have been. I picked up any book that caught my eye, and, generally speaking, the lessons learned frequently were forgotten. Now, I pick a topic and read four to six books back-to-back on it. Recent topics have been how to learn, economics, and future trends. Next up: refreshers on blockchain and data analytics. Reading multiple books on the same topic is beneficial. There is the repetition, of course, but also the differences between them. I process the information differently now with an internal conversation of comparisons and contrasts that cement in my mind what I am learning. Most learning, experts say, is done via other people, and that is true for me. I gain great knowledge and pleasure by surrounding myself with people I respect, enjoy, and can learn from. I run two gubernatorial advisory boards and a group of innovators from large corporations. I ran centers of excellence in data analytics, IoT, and innovation. I have a history of professional and civic contribution engaging in various organizations and institutions because I believe in their missions. I have gotten incredible personal satisfaction from doing so. In past and current roles, I have been responsible for strategic partnerships that expose me to different organizations, disciplines, and people. This choice is strategic and proactive, and it pays off not just in the value I can provide, but in personal fulfillment and sheer fun; I highly recommend it. To Mark Cuban's advice to outwork everyone: I, too, have an astounding work ethic. As my son puts it, not everyone has my drive. While this remark was a result of our conversation regarding his chores, he nonetheless has a point. But having drive is easy when you have work you love, and I always have. My current position with the state of Illinois—my first public sector gig—is an astounding learning opportunity. I am surrounded by a great team that I learn from every day. I have so many meaningful puzzles to solve. Bring it on!